カーインテリア（カーファッション）の国内シェアトップ企業です。カーシートカバー、クッション、ハンドルカバー、マット、収納小物など社内空間を演出する様々な商品を企画、製造しています。Our company is Japan's top car interior manufacturer. We plan and manufacture various products that create in-house space such as car seat covers, cushions, handle covers, mats, and storage accessories. Our Mission: To pursue the happiness of all employees and contribute to society through businesses which are loved by people. Our Vision: We will do our best based on self-study and ingenuity to create more valuable products. Our Core Values: We promise to create 4 core values including integrity, respect, responsibility, and passion. * We are supplying products for car interior stores home centers nationwide under the "BONFORM" brand. There may be 12 times per annum you need to work on the weekend. 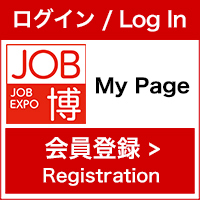 We are looking forward to seeing all of you at JOB HAKU.